"Tolerance is over-rated. We don't want to be tolerated, we want to be accepted. Even better, we want to be valued." That was the way a gay rights activist started a presentation about the work which eventually led him to the White House and meeting with the president. As we approach April, I'm reminded of that lesson as I update this post which was originally titled "Autism Awareness Day." April is Autism Acceptance Month and April 2nd is World Autism Awareness Day and Reach And Teach is joining with thousands of organizations and individuals around the world to do a shout-out of love, acceptance, support, and yes, for those who aren't aware of how many people are impacted in some way by autism, we hope to spread some awareness. If you happen to have arrived at this page with little awareness about autism, you can click here to get a quick definition. 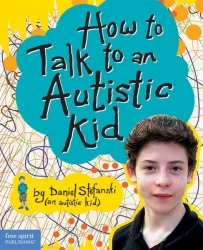 We had a teenaged boy and his mom in our shop one day and after they had spent some time looking through some of our bookshelves the boy came over and asked "What have you got on autism?" I showed him some books but none really clicked. He said "I'm looking for something that has more data, more statistics, because I'm doing a report on autism for school." I then found the perfect book and he and his mom came to the register and made their purchase. I asked him what had sparked his interest in autism as a subject. He looked at me and said "I'm autistic." Having read quite a bit about autism a quote from one of the books came to my surprised mind. "If you've met one person with autism, you've met ONE person with autism." Yep! We all have room to grow and lots to learn. Click here to read a post by a mom with a daughter with autism about her experience talking to a reporter about autism. (The blogger was chosen as one of the Top Ten Social HealthMakers by ShareCare. -- Thanks Holly T. for sharing that news.) Here's her 2015 post about this upcoming month. This year one of her friends created his own graphic and idea for April, going beyond "awareness" and moving towards acceptance and respect. We're all for that! And, while we're at it, we'd like to share some information on how many people in your midst could use a little acceptance, respect, and love! In California, according to a UC Irvine report, one public school child in 63 has been identified as autistic and is receiving special education services. Let's meet one person with autism. OK. How about one more? Nick Bennett Day from WDUN TV on Vimeo. Here's a problem, though, when you see these three amazing kids... you also have to think about stereotypes... Stereotypes can cause you to either expect a child somewhere on the spectrum to be incapable of anything or... a prodigy. The truth is, like any other group of people, identified as a group because of some common thing, people with autism are on a spectrum, individuals with unique gifts, talents, challenges, personalities... and the key for them, like anyone, is for them to have the opportunities and freedom to become the very best individuals they can possibly be. That's where understanding, community, love, support, encouragement, patience, and so much more come into play. Every child, every person, deserves wild cheering, standing ovations, hugs, outpourings of love, so that every single child can shine. That's why we want to light up the world in blue EVERY DAY, to help each and every individual thrive. View my autism as a different ability rather than a disability. Look past what you may see as limitations and see my strengths. I may not be good at eye contact or conversation, but have you noticed that I don't lie, cheat at games, or pass judgment on other people? I rely on you. All that I might become won't happen without you as my foundation. Be my advocate, be my guide, love me for who I am, and we'll see how far I can go. "View my autism as a different ability." That's what's happening at a very special car wash. Check out this video. From Awareness to Acceptance And Beyond! Our friends Len and Libby Traubman have helped lead a Jewish/Palestinian living room dialogue group for over two decades. Their key to peacemaking, which they now teach to people in conflict all over the world, is listening to other people's stories. "The shortest distance between two people is a story." "The difference between an enemy and a friend is a story." Those are the lessons they've taught to so many people. But, what if it is difficult to hear someone's story? People on the spectrum often have a very difficult time communicating so it may take a lot more work on our part to "hear" their stories. The effort, however, will be worth it. Each year, I meet April with a bit of existential dread. Each April, I am once again made aware that to most people, autism means broken, defective, a victim of a fate worse than death, a problem, a disease, something that needs to be fixed, cured, and changed. This has been the predominant view of autism for decades. The world doesn't need more awareness of Autism, it needs more acceptance of Autism. Acceptance is understanding. Acceptance is building on a person's strengths to enable growth and independence, not viewing a person through the confining lens of ableism. Acceptance means acknowledging that different is not defective. Acceptance requires work. Acceptance is an action. I am different, but I am the same as you in every way that matters. I think. I feel. I triumph. My differences make some things more difficult, but they do not make me less than you. 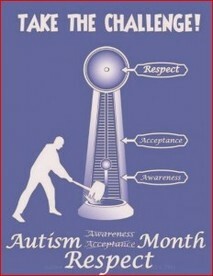 Get started by checking out the resources at Autism Acceptance Month. 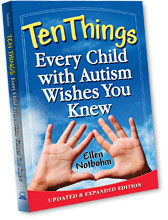 Also, our friend Patricia Tilton has reviewed a lot of wonderful books over the years in her Children's Books Heal blog related to autism. Click here to visit her Autism Acceptance Month page. Among our friends and colleagues there are many who have children somewhere on the ASD spectrum. Because of our connection to autism and our belief that inclusion, respect, acceptance and support for people on the ASD spectrum and their families is a social justice issue, we have collected some great resources on autism. Those are shown below. Please let us know about other resources you love, including web sites, books, organizations... Click here to email us with your suggestions.